I’ve been fortunate to visit Italy several times and, in the past, my goal was to eat my way up, down, and across the peninsula, Sicily included. Safe to say: “Mission accomplished.” This last visit was different, though, and probably due to my joining WordPress. I wasn’t satisfied to just enjoy my meal, I wanted to know its ingredients and, if lucky enough to have an English-speaking wait person, its preparation. If you saw the FaceBook entries I published during that trip, most were photos of the meals we enjoyed. With a notoriously bad memory, this was the easiest way to record those dishes and, hopefully, jog my memory months, even years, later. Such is the case with today’s agnolotti … kinda. While in Bologna, one night I ate at a small restaurant that I chose because it was crowded with locals and had a nice outdoor seating area. Coming from Chicago, eating supper outdoors in mid-May is something you don’t pass up if the opportunity presents itself. I ordered the tortellini and asked my waiter how they were prepared. Looking puzzled, he disappeared and returned with a woman I was to learn was a sous chef. In broken English — that was still far better than my Italian — she answered my questions and before leaving, mentioned that she was from Piedmont, Piemonte, coincidentally the region of Italy that is home to agnolotti. I asked how she made her agnolotti, she smiled and said that the filling for the tortellini I had ordered was very similar to her own agnolotti filling recipe. Our entire conversation didn’t last 5 minutes — it was a busy night — but she did give me its list of ingredients before returning to the kitchen. When my dinner arrived, I took a photo and made a note of her ingredient list. Jump ahead now to last month, November. Traditionally, it’s the time for my last visit to Michigan before Winter sets in. While there, I like to fix Zia a birthday dinner and maybe even a Christmas dinner, since I won’t be with her for either events. This year, I wanted to serve her agnolotti for her birthday dinner. The only problem with that plan was that I had never made agnolotti before. The Saturday before I left for Michigan was the last day the Chicago area’s farmers markets were open. When I returned home, I realized that there wasn’t much time for me to make a test batch of agnolotti. I was to leave in a few days and had much to do beforehand. Not wishing to use premium ingredients for something that would be little more than a kitchen experiment, I dug around my fridge and freezers for ingredients and that’s how today’s filling came about. Well, having bought a bunch of lacinato kale, cavolo nero, at the market that morning certainly didn’t hurt matters any. Let’s be clear. I seriously doubt this is in any way a traditional Piemontese recipe. I will say, though, that it was surprisingly good, good enough to convince me to share the recipe along with this instructional post for making Agnolotti del Plin. When I make the filling again — and I will make it again — I won’t grind it so thoroughly and will use it to make ravioli. 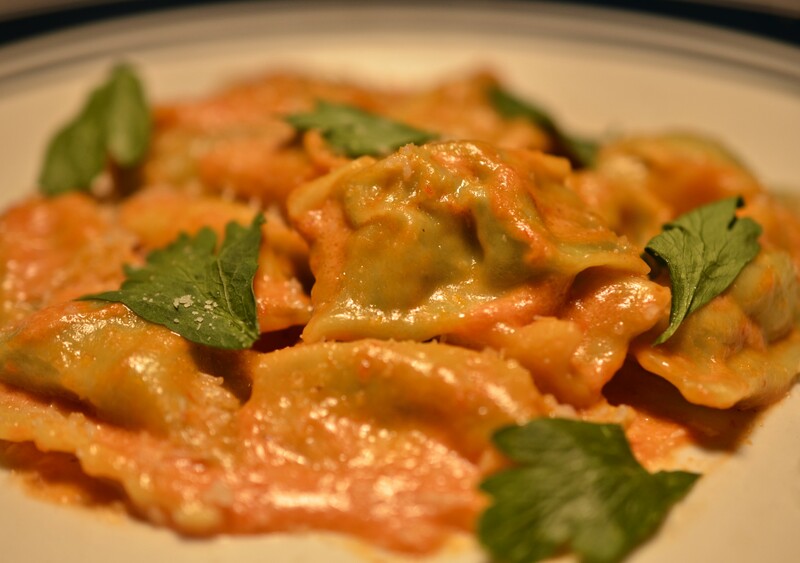 As you know, stuffed pastas are popular in Italy, with ravioli, tortellini and cappelletti being the most common. Agnolotti are a stuffed pasta that, as I mentioned, originated in Piedmont and are almost always handmade. Their filling consists primarily of roasted meat, though exceptions abound. (This is consistent with the filling recipe that I was given at the restaurant.) I was surprised to learn that traditionally, freshly cooked agnolotti were eaten as-is, without any form of dressing/sauce at all. The family ate them, one at a time, from a large serving at the table’s center. Agnolotti del Plin are formed by pinching the dough in-between the individual agnolotto, “plin” being the Piemontese word for “pinch”. As you’ll soon see, once pinched, the agnolotti are cut and ready to be cooked. There is another way to make agnolotti and you’ll see how that’s done in a future post. This one is already getting too long. Heat equal parts butter and olive oil (no more than 3 tbsp total) in a deep frying pan over med-high heat. Once hot, add the shallot and sauté until translucent – about 3 minutes. Meanwhile, roughly chop the cleaned & trimmed kale leaves before placing them in the pan with the shallots. Season lightly with salt & pepper and sauté until wilted. Allow to cool and drain as much liquid as possible from the cooked kale before placing it in a clean kitchen towel. Wring out as much liquid as possible. Set aside. In the same frying pan, melt another 2 tbsp butter over medium heat. Add the chicken gizzards, season with salt and pepper, and sauté until fully cooked – about 20 to 25 minutes. Remove from heat and allow to cool. Once cooled, place the cooked gizzards into a food processor and process until well ground. To the chopped gizzards in the food processor, add the cooked kale, ricotta cheese, Pecorino Romano cheese, egg, nutmeg to taste, and season lightly with salt & pepper. Process until smooth. This is critical. Remove and refrigerate several hours or overnight so that the flavors will blend. Using a jumbo egg-sized piece of dough, pass it through pasta rollers until thin. My rollers are at the widest setting at “0” and I roll the dough up to and including the no. “7” setting. Place the dough strip on a lightly floured work service, trimming both ends to make an elongated rectangle. Fill a pastry bag with the filling and pipe a line of filling about an inch from the dough strip’s edge. Use a water bottle to mist — or a pastry brush to lightly moisten — the dough on the side of the filling farthest from you. Do not get it too wet or it may split during subsequent steps. Carefully take hold of the dough’s edge and pull it over the piped filling. Use your fingers to press/seal the flap to the moistened dough, eliminating as much air as possible as you work you way down the strip. Use your index fingers and thumbs to pinch the filling roll at inch intervals. Use the same tool to cut the agnolotti at the center of each pinch. Place the agnolotti in a single layer on a baking sheet that has been dusted with corn meal. Cover with a clean kitchen towel. If they are to be cooked relatively quickly, nothing further needs to be done. If they are to be cooked in a couple of hours, they should be placed in the fridge until dinner time. If the are to be cooked later than that evening, place the baking sheet in the freezer and,once frozen, place the agnolotti in bags or some other container suitable for freezing. I really hadn’t thought this all the way through and was caught scrambling for a sauce once the agnolotti were made. I turned to an old favorite that, as luck would have it, helped me to continue to clean out my fridge before leaving for Michigan. Bring to a boil a large pot of salted water over high heat. Meanwhile, in a deep fry pan, melt a few tbsp of butter over medium heat. Add about twice as much heavy cream and heat until the butter is melted. Add enough Pecorino Romano cheese to thicken the cream mixture. Add an amount of plain, meatless tomato sauce equal to the amount of cream added earlier. Stir and keep hot until the agnolotti are cooked. If the sauce thickens too much, add a bit of the pasta water to thin it. Taste and adjust seasoning as required. Once the water is boiling rapidly, add the agnolotti and stir. When the water returns to the boil, lower the heat and gently cook the agnolotti. If the agnolotti are fresh or refrigerated, they are fully cooked when all of them float to the surface of the pot of water — just a few minutes. If the agnolotti are frozen, they will take a few minutes longer. If in doubt whether your pasta is fully cooked, sample one. Once cooked to your satisfaction, use a spider strainer to remove the agnolotti from the boiling water and add them to the simmering sauce. Gently stir to coat the pasta with the sauce and serve immediately, garnished with more grated Pecorino Romano cheese and, fresh parsley and/or basil, if desired. YouTube contains quite a few videos showing agnolotti del plin being made. Some folded the filling roll over a moistened flap, as I did in steps 6 and 7 above. I thought that would ensure the pasta was fully sealed. I also skipped those 2 steps with a subsequent dough strip. Later, I cooked them both, fresh and frozen, and neither opened up while being boiled. In short, it made no difference whether you folded the filling roll over the sealed flap. You can follow the method you feel most comfortable doing. Make sure the gizzards are fully cooked. “Rare” gizzards are not a good thing. Because the filling is to be piped, it must be ground in a food processor, or similar device, until very smooth. The filling may block the piping bag’s tip if not ground fully. When making the tomato-cream sauce, if you haven’t any tomato sauce on hand, a couple tbsp of tomato paste may be substituted. The tomato-cream sauce used to dress these agnolotti is simple to make and can be used for a number of stuffed pastas. I often season it with a bit of nutmeg but, this time, the agnolotti filling already was seasoned with the spice and I didn’t want to over do it. A little nutmeg goes a very long way. Continuing with a review of seafood dishes suitable for A Christmas Eve feast, today’s I’m highlighting Mom’s Calamari Salad. It’s a snap to make and is a welcome addition to any celebratory meal, Christmas or otherwise. Another reason for selecting this dish is that its post contains links to a number of seafood dishes and recipes, in case your Feast of the Seven Fishes is minus a few fins. All of this may be yours simply by clicking HERE. This entry was posted in Home-Made Pastas, Pasta/Rice/Soups (Primi Piatti) and tagged Cooking, Food, Heavy Cream, Italian, Pasta, Recipes by ChgoJohn. Bookmark the permalink. Thanks, Eha, for the nice comment and for the warning that the link wasn’t working. I think I’ve handled it. Will be there and waiting and the stock will be made ! Glad we are getting a Christmas gift of two posts 🙂 !I was still working at the computer [still partly on strike since the lightning hit!] when your post came in – possibly I just tuned in a little too early! This is an interesting recipe. I haven’t seen this technique before. You have done so much work to bring us this post, I loved your picture story on making them. I noted the use of a water spray, I don’t know why I haven’t thought of using one of those. As always John your post is so well researched and written and will be marked for me to have a go at. Thank you so much, Maria. To be honest, this was the first time I used a spray bottle. I found that a pastry brush — or at least the one I was using — made the dough too wet and it would tear when I pinched it. The spray created a fine mist and worked perfectly. Later, I used a pastry brush (step 6) because the agnolotti were already formed and tearing wasn’t a concern. That sauce is a good one to keep in your vest. It is so easy to prepare and no one will guess that you whipped it up in under 5 minutes. It’s been a life saver for me. As for the cranberry sauce, there’s not much to it. Here, our cranberries come in 12 oz (340 g) packages. In a medium saucepan, heat 3/4 cup (177 ml) of water, 1/4 cup orange juice, and 3/4 cup (170 g) of sugar, and a pinch of salt over medium high heat. Once the sugar has melted, add the cranberries (fresh or frozen) and cook until most of the berries have burst — or as many as your prefer. Take off the flame and add as much orange zest as you like. As I mentioned at your “place”, this is quite similar to your recipe and I think next time I’ll skip the water and add the OJ, just as you did. Btw, what does “agnolotti” mean? Were these traditionally made with lamb, or do the shapes resemble sheep tucked into the fold for the night? Did you write Santa a letter — or at least leave a note on the fridge? Santa is getting older and his memory isn’t what it use to be, from what I’ve heard. Why else am I still waiting for a Tuscan villa? Agnolotti seems to be derived, in a round about way, from Latin for “rim”. It’s earliest form was more oval-shaped, apparently. I doubt if lamb would have been used for filling in Piedmont, where agnolotti originated. Sheep are far more common in Abbruzzo, a mountainous region on the Adriatic, opposite Rome. I’m sure they’ve made lamb-filled ravioli, something I’m going to try to make. John, this looks delicious! You’ve inspired me to seek out the best Italian for lunch today. I will have to try this across the holidays. A little late but I hope you found a great place for lunch. Please let me know if you make agnolotti for the holidays. I’d love to hear how you made your filling. Don’t worry John. I’m sure every Piemontese family has a special recipe for ravioli and each one is different! Do you know what a “plin” is? A nip. That’s what you must do to seal up each agnolotto. Great post as usual, John! you know we were in Chicago at the same time as the infamous Polar Vortex visited too… pathetic. loved everything about this post, just wish I had the energy to make this dish from scratch soon. It seems I’m always postponing it to another time…. Thanks, Sally. Yes, I knew you were here and hope you found a good place to eat. I was driving North, right into it. Won’t be doing that again anytime soon, I promise. To be honest, I’m not so sure that I’ll be making agnolotti again. I’ve nothing “against” the pasta but it’s just that I’m so much more experienced making ravioli and I can make them so much faster. Even so, with your schedule, I can see why you’re postponing this. You are far busier than I. It’s a wonder that you’ve time to do all of the bread baking that you do. John its not just your blog that the link doesn’t work I have encountered this a couple of times with different blogs I think wordpress are tinkering with the cotton reels. Thanks, Marina. This problem was all my fault. I’d posted it with a date of November, 2014, rather than December, 2014. I realized my error immediately and reposted it but the damage was done. Creating a 2nd link with the correct post worked fine. Thanks for your understanding. I need to be a better proofreader. John, what a terrific dish! I’ve had angolotti many times, but never made it. I definitely must try it, and love the idea of stuffing it with a mixture including chicken gizzards. Wonderful recipe, fun story behind the dish. Thanks. These were my first attempts, too, John. (There’s another, more traditional, post coming in a couple of weeks.) Gizzards were literally the cheapest protein I had on hand to experiment with. I needed experience with the pastry bag and “pinch” The photos don’t show the many rejects. It was a complete surprise when I cooked a couple and tasted them. Not only did they remain sealed but they tasted great! Granted, compared to penicillin, this may not be the World’s greatest discovery but it works for me. 😀 As always, John, thanks for commenting. Mmmmm … Duck gizzard confit agnolotti. Now, that sounds wonderful, MD. I consider myself lucky to find chicken confit, but gizzards? Duck gizzards? No, that’s not going to happen, not anytime soon, in any event. The soup recipe is a very simple one but it’s been used by my family for a very long time. I hope you’ll like it. Okay – any substitutions for chicken gizzards I can use for my crew? And are my eyes deceiving me or is it snowing on your blog today? Agnolotti traditionally are made with beef, veal, pork, or rabbit, often a mixture of those. You’d have to adjust the cooking time depending on the type of meat. Thanks! You are right – no need to specify chicken part… What they don’t know won’t hurt them! Looks absolutely delicious, John. I don’t think I’ve ever eaten chicken gizzards. It sounds quite adventurous. 🙂 Looks like you and Zia had a lot of fun in the kitchen preparing her birthday meal. That sauce! Oh, my! That’s the first thing that caught my eye in your lead photo. I can be pretty sure I will buy ready made ravioli or other stuffed pasta, but I must make this sauce! Deliciousness!! Glad you liked it, Angeline. It’s my go-to sauce, kinda in-between a red sauce and an Alfredo, and it’s perfect for any stuffed pasta. I’m sure you’re going to love it. How super YUMMY !!! I just pinned your mother’s pasta recipe and now I’m going to pin this baby! If we don’t ‘speak’ before the holidays I wish you a “Joyeux Noël et Bonne Année” !! ++ My twin sons and their families, and my twin brother and his extended family will be here the 20th for what we call our Roy Christmas. I always serve a pasta dish – and – if I get organized enough, I’d love to make this!! How nice that so many of your family will be able to get together. I hope you all have a wonderful time together, Cecile. Buon Natale! Wow, John – your agnolotti are beautiful! From the shape, to the beautiful hue of the filling and then that “made on the fly” sauce! I bet Zia experienced love at first bite when you prepared the dish in Michigan. 🙂 I always look forward to experience your offerings via a new post…this one did not disappoint! Thank you for continuing to inspire and instigate hunger pangs! That sounds marvellous, john would love it. However for myself feeling as rotton as i do today The garbanzo bean soup looks REALLY good.. can’t wait. I knew C would love the chick peas! Great recipe! Great photos. I would love to try this. I’ve been meaning to make my own pasta for a while. I don’t have any equipment so I’m going to do it old school. I love the gizzards. That soup also looks fab. I love garbanzos. You don’t need a machine, Amanda. Mom and Zia rolled out their pasta by hand for decades and, even today, Zia wishes she could hand roll it. I really do hope you do give pasta making a try. That first dish of pasta you serve is one you’ll never forget. Yum! Hi John, so nice of you to supply Zia with wonderful agnolotti. Isn’t it great to travel around Italy just to sample all the food? Good for you that you talked to the sous chef and asked about the recipe — I really should do that more often and get more mileage out of my Italian skills. I was thinking “where is this going” when you mentioned Bologna in a post about agnolotti. But luckily the chef was from Piemonte. Agnolotti are on my repertoire, but I have never made the smaller and pinched ‘plin’ variety yet. I would worry that the agnolotti won’t close properly with a continuous line of filling like that — I would use dots of filling instead. But apparently it worked for you after all. I haven’t heard of chicken gizzards being used for agnolotti, but the combination of braised meat with greens is definitely traditional for agnolotti and thanks to you I know that those gizzards are very tasty. The traditional sauce to serve agnolotti is actually the gravy from braising the meat. I like pink sauce, although it is not traditional with agnolotti. Neither is ricotta in the stuffing, by the way. Like me when I did a post on agnolotti, you cheated a little and used Tuscan cavolo nero in Piemontese agnolotti. In Piemonte they would use spinach or savoy cabbage. Personally I like cavolo nero better, but in the 1800s that simply wasn’t available in Piemonte. Cavolo nero is delicious, although I don’t like all the work involved with removing the ribs. What a wonderful looking pasta dish, and the story is even better. Should I ever make it back to Italy I think I will definitely pay even more attention to the meals. I have been several times, but since I started cooking more and blogging I am even more interested in exact ingredients and preparation than my teen to early 30s years! I am very much looking forward to the garbanzo soup, I just love garbanzos. They are in tonight’s dinner! Thank you. We are very much the same. All of the times I’ve been to Italy in the past, I was only interested in eating the food. This last time, sure, I still wanted to eat it but I also wanted to know all about it. I was very fortunate to find that the wait staffs were most helpful. 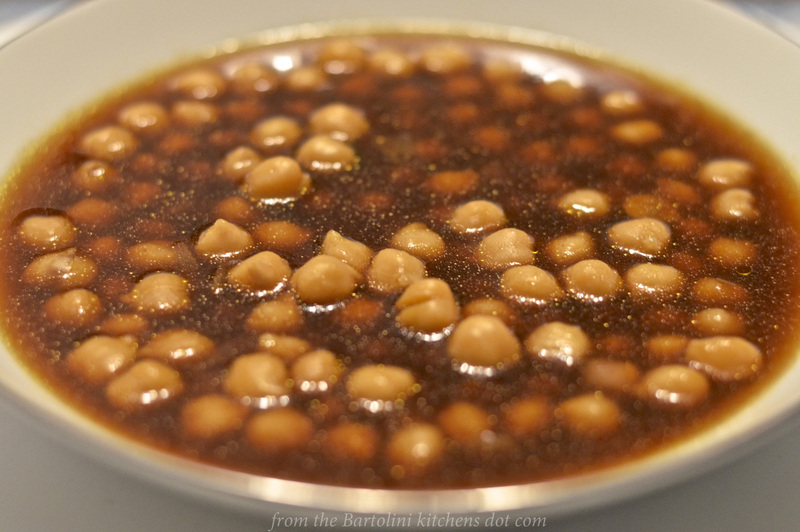 The garbanzo soup comes from my 2 Grandmas and is really quite simple — but very good. I hope you’ll like it. I too, have brought back many recipes and food memories from trips to Europe and each time we make the recipe we are always magically transported back to that very time we enjoyed that dish. It’s such an amazing way to experience life, isn’t it? Whether it be a trip or just a simple family dinner. Your agnolotti del plin is beautiful and I know I would love the filling because I am one of the odd people who love chicken or turkey gizzards! I only ever get to eat them if they are mistakenly left in the bird and I cook them in the gravy (then I sneak them throughout the day because some people (who shall remain nameless) think they are ‘gross’!). Interestingly enough, agnolotti here are somewhat larger ravioli, sometime even as large as a saucer and they have varying shapes; I’m not sure that it traditional or even if del pin with agnolotti means something entirely different (I shall google it). We’re expecting our first real snowstorm with about 10 cm (4″) tonight and the same, perhaps more tomorrow so this dish would have been perfect. The tomato cream sauce also sounds quite delicious indeed. 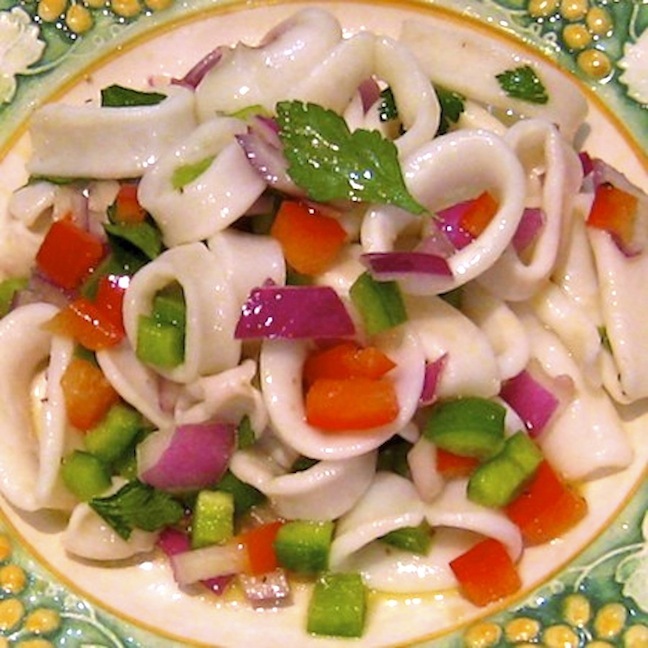 I love calamari salad, I’ll have to put it on my list of things to make over the holidays. The garbanzo bean soup sounds wonderful, can’t wait to see that recipe. Late May is about the latest we can eat outside here! This looks great, but I’m really looking forward to that soup too. You’re really not that far from here but your climate is so vastly different. Despite the forecasts we’d seen before leaving, the weather in Italy was just about perfect. Even in the mountains, in San Marino, I went without a jacket. In fact, the only time I wore one was the few times it rained. My goodness, that looks absolutely delicious (with “that” meaning every picture you posted!) Thank you so much for your recipes and your delightful blog. That is such a nice comment. Thank you for taking the time to write and leave it for me. I love eating chicken gizzards but never tried them in pasta before, this looks amazing and delicious! You’ve just added another recipe to my to-make list, John, I have too many! I’m so glad that you like them enough to want to make them, Jasline. Mom would be proud, as her sister, my Zia, is now. Thank you. Ahhh John, I think I need to work up to this one! 😉 It does look so delicious though… those perfect little filled pillows of pasta goodness! Also love the idea of the creamy tomato sauce just to coat the pasta – seems so very versatile and would come in handy for many a dish. Hope that Zia’s Birthday Agnolotti turned out to be just as beautiful! Hope you’re having a lovely week. Not to worry, Margot. There are other, easier stuffed pastas to make before you attempt these. We’ll get to each one whenever you’re ready. I’ve been down this path with others and I get a kick knowing that you’re serving your family your first pasta or lasagna or ravioli, etc. All in due time. My week is going very well and I hope you can say the same. I have never been served agnolotti and it looks delicious! I have slowly been learning to make fresh pasta, using your mother’s recipe, by the way, but haven’t yet tried any filled with meat. The added step feels a little challenging, but you do provide such very thorough instruction I ought to be a little more adventurous! I felt a little tug at my heart thinking that you would probably really love to be with Zia at Christmas, and yet, I’m sure it isn’t at all practical, or maybe reasonable, given the storms this time of year. It’s really special, though, that you cook for her in advance and leave a little bit of yourself in Michigan for both birthday and Christmas. I’m sure she must feel very loved and appreciated, John. Nice! Excellent recipe, as always! I’m not sure I can find chicken gizzards here, but it might be worth asking my butcher. The slide show is an inspired addition to the post. Great to see how it is done. That’s very kind of yo to say, Barb. To be honest, I feel very comfortable making pasta and am very willing to experiment with fillings and techniques. In no way do I feel anything similar when dealing with any other form of cooking or baking. For everything else, there had better be a recipe or guide on-hand or heaven knows what the outcome will be. You make it look so simple, Mr. John. For me, it would be an all day project. Looks delicious. Next time I’m home in Chicago with my family, I may look you up to get one of your delicious meals. BTW, how nice of that sous chef to come out and give you the ingredients (especially when so busy). I don’t know if a chef here in America would do the same. You will be surprised how much more quickly the process becomes as you gain experience. Yes, the first attempt is kind of rough, as you learn what works best for you. Once you do, you’ll get a rhythm and then you’re off and running. Promise! And I’ll be here to answer any questions you may have. Well, I know I followed all your food exploits in Italy this summer, even though I was a bit green with envy…but very happy for you! Your photos of all your meals were pretty amazing. How fun to actually have the sous chef come out and give you her recipe! So nice, and only in Italy, can you imagine that in Chicago? These look amazing. I love the Tuscan kale in it, but I may have to switch out the gizzards! You know me, I’m a strange foodie. Thank you so much, Nazneen. All’s well here. I wouldn’t worry about the gizzards. You’ll get a more traditional filling recipe in a couple of weeks and I think you’ll find it more appealing. If not, let me know and I’ll create one for you. No problem. Hope all is well with you, too, my Friend. I know what you mean about eating outside – I really miss it when we’re not in Spain and we were reminiscing the other day about how we ate New Year’s Day lunch in the garden a few years back when my parents came to Spain! Love talking to the chef/cook too – so many little hints and tips. Another great post John, so well presented and I loved the how to for a dish of pasta that is new to me … which I love! Oh, Tanya, I was in heaven, eating every meal outdoors unless one of the few showers drove us indoors. Even in San Marino, where it was supposed to be much cooler, my going away breakfast was served on Zia’s terrace. I could not have asked for better. I’m not surprised you’re not familiar with agnolotti. Zia wasn’t either. It’s a Piemontese dish and, apparently, not very popular in other areas of Italy. Believe me, I asked for it and no one served it. That sous chef was heaven sent. Steve and I are still talking, almost a decade hence, about the lamb agnolotti we had on a brief trip to Piemonte. Now, we have no excuse but to see if we can recreate that wonderful memory! I, too, am wanting to create a lamb ravioli. A commenter a few weeks ago mentioned that he used lamb shanks and Zia and I have been talking about it ever since. I look forward to seeing your creation. I bet it will be fantastic, Michelle. You must have so much more practice making pasta than I do because yours ALWAYS turns out looking absolutely perfect. Mine…well let’s just say it might taste good but I always end up with kind of un-pretty pasta. I love how you manage to get your recipes & of course you do know how to adapt them to what you have available. Perfect sauce to go with these little babies too. Thank you, Fae. I’m so glad you like this recipe. Like you, I never asked the wait staff anything but for the check. Now, maybe because of blogging, I don’t hesitate to ask. If they won’t cooperate, well, nothing ventured, nothing gained. Lots of good tips here, John – thanks! For example, I like the idea of refrigerating the filling overnight. That makes a lot of sense. And you’re right re: a little nutmeg going a long way. Thanks, Ruth. I’m glad you enjoyed the post. It’s pretty much a rule of thumb that our fillings should be allowed to “rest” for at least a few hours or overnight. Be careful, though, with the fillings that contain raw egg. Don’t let them sit much longer than overnight. These agnolotti del plin sound wonderful but that story about meeting the sous chef in Italy and learning what went in the food is a connection that will stay with you forever. Wonderful pasta as always John. Great back story to this too – a true food enthusiast!! I knew of Australia’s wines, of course, but didn’t realize that other wines were scarce. I guess the shipping costs would make European vintages too expensive. Never thought about it. Oh, I will look forward to the next post! Yes, Aussie wines are generally cheaper. My local bottle shop only has 2 or 3 Italian wines available in an entire warehouse and maybe 1 Spanish. There are a few specialty wine stores but v. expensive. I’m seeking them out, though! Thank you for the birthday wishes. Zia does enjoy it when people are so thoughtful. Have a great week! Mmmmm. I’m drooling. I’m on the train (late) from a holiday party and I’m starving. This would hit the spot! Then again, even if I was already stuffed full, this would hit the spot. You know me and pasta! always appreciate being introduced to new foods here. And I especially love that they’re not new-fangled–just old-school recipes you’re bringing back. May I please have this for dinner? Perfect instructions, thanks for sharing! For a test run, John, this turned out mighty fine! I have not had this type of pasta before but yours looks so light and delicious but I am sure it is rich with the chicken gizzards inside.